In early September at the Supermobility/CTIA conferences, I moderated a discussion about the future for the Internet of Things (IoT). The women in technology panel focused on multiple layers of the IOT world. With the world being constantly plugged into different devices, we're becoming super connected to everything, changing the consumer and business landscape. Our discussions covered what some top companies are developing as best practices in IOT -- from infrastructure and R&D to market strategy and successes or failures within each structure. We had a very thought-provoking conversation about connected devices, crunching Big Data, and even creating innovative hypotheses to drive businesses. IoT means a paradigm shift in how we perceive technology. So, how do you analyze and segment data to drive business intelligence in an age of IoT? Are there consequences? Our discussion addressed these questions while sharing knowledge from experts in the industry on the hottest trends for staying connected in the future. 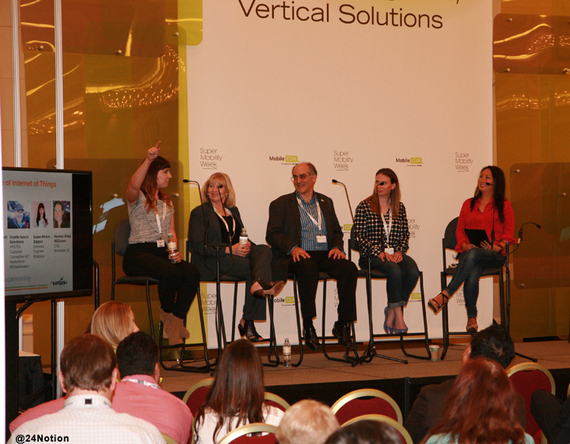 We had a stellar line-up, with names from Intel, Salesforce, Rocketeer, 24Notion and Zappos. What was especially compelling about this line-up was the fact that three-fourths of the panel was women leaders. Women are leading the charge in these companies! Sure, we had Charlie representing the man's perspective so we could have some balance, but it's not often that we get to see such a strong female presence among business leaders. It really showed the future not only of information and IoT, but also who will be leading these efforts. Susan Hinton is an engineer by day, and at Zappos is a maker by night. Holly Barrett has been with Intel for many years running finance and has also been the controller for IoT development on many projects throughout the years. Heather Wilde made her mark at Evernote with her killer customer relations skills. She has been part of an entrepreneurs incubation project within the Tony Hsieh initiative, and is a big champion for women in technology. Charlie Isaacs runs the customer connection within IoT, primarily being responsible for incubating and supporting customers connecting their products to Salesforce (not to mention that he has a long and impressive list of previous career accolades. He is also an avid supporter of women in the technology industry. Our line-up of thought leaders really set the stage. It was a group of diverse backgrounds and skills, but all were tied together with a common thread: their support for women in technology, which helped bring out such rich and deep conversation over IoT. This recent Business Insider article states that The IoT will result in $1.7 trillion in value added to the global economy in 2019. This added value will result from the efficiencies of IoT coming out of things like installation costs and management services. Further, it's predicted that The main benefit of growth in the IoT will be increased efficiency and lower costs. Efficiency will be realized everywhere that IoT can take place -- in homes, throughout urban metropolises, workplaces and even consumer devices. Many are skeptical of these individual devices because of security problems, but it's clear that IoT has arrived and it's here to stay. As the future brings more and more IoT, it's up to innovative thought leaders like our panelists to lead the way for its mass use. The business outcomes with IoT is huge, as our panel showed, but there's still so much more that can come from this. This is just the beginning of IoT, but it's already revolutionizing what we know about information.